It was the first chemical messenger discovered by Bayliss and Starling in the year 1902. The historical significance is that the term hormone for chemical messengers has been coined by them after the discovery of secretin. It is secreted from the S cells of intestinal glands in the mucosa of the upper part of small intestine. The structure is very close to glucagon, VIP and GIP. Its half life in the circulation is 5 minutes. 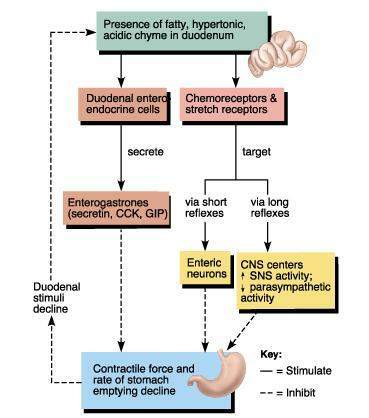 Secretion of secretin is stimulated by the acid chyme entering the duodenum. The alkaline secretion produced by secretin, helps to neutralize the acidity. Causes contraction of pyloric sphincter. GIP (gastric inhibitory peptide) is produced from K cells in the mucosa of duodenum and jejunum. Secretion of GIP is caused by the presence of glucose and fat in the duodenum.